I'm a little surprised, but only a little, that none of the participants in the various "one fly" discussions has stood up to declare that his one fly is the woolly bugger. Perhaps they are concerned that the purists would consider them impure, or at the very least unsophisticated. 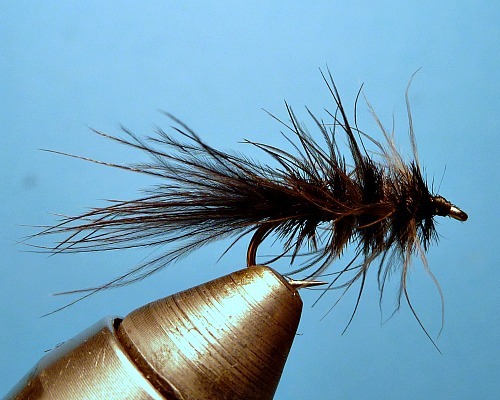 Had the "one fly" discussions that come up from time to time on the Tenkara USA forum occurred on a forum devoted to western fly fishing, more than a few would openly declare that they fish only the woolly bugger and that they do very well with it. No one would doubt that they do - and for just about any species of fish they target. To say the woolly bugger is a versatile fly is like saying the sky is blue. No one will argue with you, except to point out that sometimes the sky is black (and black is a pretty good color for woolly buggers, by the way). What prompted this post was a comment by the late Jack Gartside that one of my customers had passed along, in which he mentioned catching a permit and some bonefish one morning in Florida, and a brown and some rainbows in Montana that same afternoon, all on a woolly bugger. That was followed by an account of one of the customer's guide friends who was racking up species after species caught on just a black woolly bugger. Seems he struck out on tarpon. Always wanting to help, I suggested that a white bugger probably would have worked - to which he replied that a white one was not part of the game. In a sense, that's how I see the one fly question. One the one hand, I do sincerely believe that for wet flies in particular, presentation is much more important than fly selection, and you could pick any of a number of flies and catch fish. On the other hand, choosing to fish only one is a bit of a game - a self imposed set of rules you play by (possibly chosen because you like the additional challenge, or possibly because it removes the added burden of having many to tie and then having to choose which to fish). My recollection of Dr. Ishigaki’s first explanation of his "one fly" philosophy was not that the black and brown fly he chose was BETTER THAN his previous favorite fly, but that it was AS GOOD AS the other fly. There are a lot of good flies, and if you are not seeking to match a hatch, which you generally aren’t when fishing wets, it is a bit hard to argue against a woolly bugger. Even with respect to presentation, which is certainly tenkara’s main advantage over western fly fishing, the bugger offers a lot of possibilities. I recall reading a posted question from one tenkara angler to another about how he fished a woolly bugger since with a tenkara rod you can’t strip it. I think it is helpful to remember that the woolly bugger was not intended to be a streamer. It was developed as a hellgrammite imitation. And while hellgrammites can swim, barely, they are mostly crawlers rather than swimmers. The most realistic presentation would be either dead drift or slowly dragged along the bottom. To drag one across the bottom, though, would require weight to get it there and a “hook up” orientation similar to that of a clouser minnow. For a tenkara rod, I think the best approach would be a dead drift with just enough of a twitch to make the fly look alive (otherwise known as the "I'm not dead" drift). Come to think of it, the slow pulsing presentation that Dr. Ishigaki, Sakakibara Masami and most of the Japanese tenkara anglers frequently use would be a very good method for fishing a woolly bugger. So, if you tied a woolly bugger without additional weight, fished it wet (is there any other way?) and fished it with the pulsing “invitation” so common to Japanese tenkara masters, who’s to say a woolly bugger couldn’t be a tenkara fly? And a darn good one at that! I have been asked for a Step by Step for the Tenkara Woolly Bugger. I have not done one, and to be honest, I don't think I've tied more than about a dozen of them all told. The Starling hackle is fragile and is a bit tricky to tie over the Ostrich herl in a way that looks nice when you are finished. I find that the Killer Bugger is just as effective and is much simpler to tie.